Third trip to paddlers park, lovely, kids love it. Unfortunately third time people have had dogs in the water feature when there are clear signs saying to keep dogs out. Having read all the Facebook comments regarding the Little Shore and subsequent dog bans, I see posts stating that the other beaches should be used for those disabled dog owners to exercise their dogs. Has anyone considered how the disabled are to access these beaches? The disabled are being discriminated against. May I request that a meeting be held with Amble Town Council as a start to discuss this matter? This if need be has to go higher than our own local authorities. It is clear that the decision made by WHC to impose the ban clearly overlooked or chose to overlook the impact upon the community as a whole. I have also noticed that WHC choses to charge disabled badge holders for the use of parking facilities. Me and the wife and the kids would like to thank Harry [McQuillen] on his very informative walk / talk [during the Puffin Festival]. Harry you are a star and once again thank you for a wonderful walk and talk. We also popped into the Masonic Hall and it was a pleasure to meet Bob and Jordan, and the son loved the fact he was allowed to sit in the Masters chair. Thank you gentlemen and I will see you both in the future. 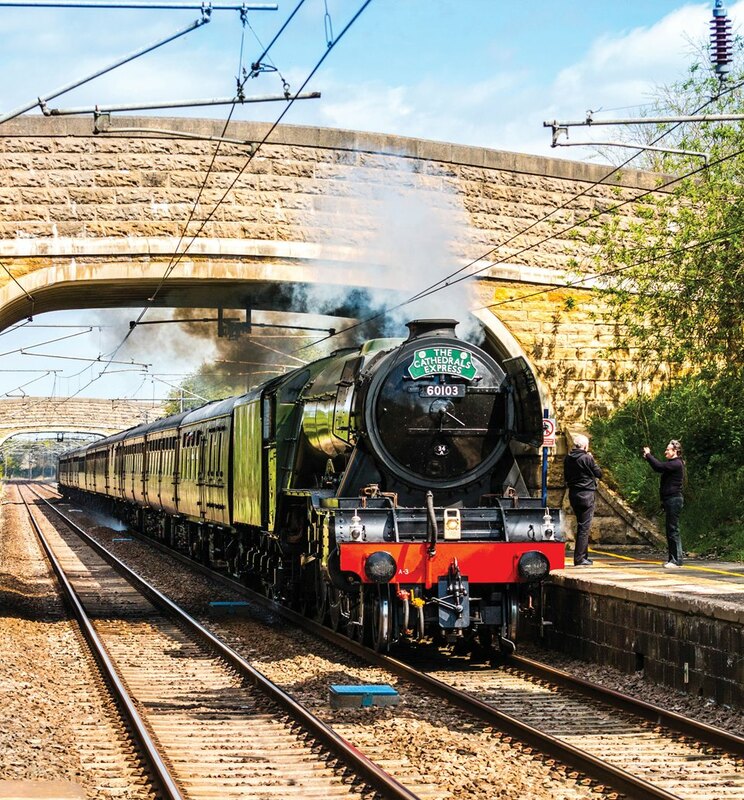 Up bright and early again and headed just up the road to Acklington platform to capture a couple of images of the Flying Scotsman as it made its return journey from Edinburgh to York this morning. What will happen to Dovecote Centre’s classes? I have heard that the Dovecote Centre is to close this year. Please do you know if this information is correct and if so whether adult education classes and other activities will still be available in Amble. Ed: We have spoken to the council’s adult learning service but they had no information on any new venue. We will keep trying! Amble’s Variety Show on May 13 in St. Mark’s Church was a huge success. The Church was so packed, extra chairs had to be found for the throng. The performers were all brilliant: we had singers (soloists and groups), piano and fiddle players, poets, story-tellers, puppets, and a tribute to the late Victoria Wood. Everyone was able to get in for free, but when we asked for donations for Christian Aid a total of £1000 was raised and we are overwhelmed by the generosity of those who attended and performed. My daughter Lyra Burst won the Puffin Trail that was held during Puffin week. Puffins are Lyra’s favourite animal and she loves visiting Coquet Island to see them. We all had great fun tracking down Pete the Puffin and discovering what he had been doing. Lyra is looking forward to trying some of the activities that Pete was doing in the future. Surfing is first on her list. 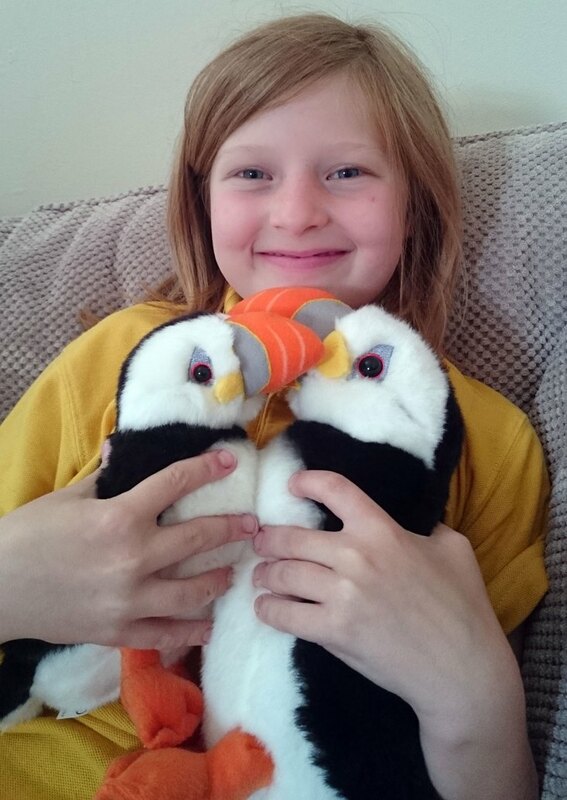 Lyra was very excited to hear that she had won the trail and was over the moon to receive her prize, she has named the two puffin toys Primrose and Poppy. My parents who live in Amble thought you would appreciate a picture of Lyra with her puffins. Get out in the sunshine and roam.